Once upon a time, it was taken for granted that when a mob toppled and decapitated a despot's effigy/icon (when the statue of Napoleon on the Vendôme column was toppled in 1871, the emperor's head was said to have rolled away like a pumpkin), they could be regarded as active agents sending a message: We demand a form of government in which all political power isn't lodged with a single head of state. However, iconicity ain't what it used to be — and neither is statue-toppling. At the center of the much-admired debut trailer for Fable III, an Xbox 360 action role-playing videogame released three days ago in the United States and today in Europe, a statue of Albion's tyrannical King Logan is toppled by Logan's brother, a revolutionary leader named "Hero" who is the game's playable protagonist. To the soundtrack of the Black Angels' "Young Men Dead," Hero (who dresses a lot like the forgotten superhero Fighting Yank) clambers atop the statue's head and fires his pistol into the air while glaring up at Logan's castle's ramparts. He's a free agent, and he's communicating a message — right? Maybe not. These days, biosemioticians would have us believe that icons are meaning-bearing sign vehicles whose purpose it is — among humans and animals alike — to elicit or provoke, at a preconscious level, a particular space-time interaction. Ants, to employ an example favored by biosemiotics booster Thomas A. Sebeok, don't choose to "milk" aphids for honeydew, but are impelled to do so by the iconicity of the aphid's rear end (which, one should explain, apparently resembles an ant's head). From a biosemiotic perspective, iconicity is about cognitive modeling, not communication. Therefore shouldn't we posit that a despot's effigy first commands us to worship and obey the despot… and then, at some later date, commands us to oust and murder him? Here in the 21st century, the notion that an icon can impel us to behave in a certain way sounds absurd. However, if I've learned anything from Significant Objects, an experiment in literary publishing and exchange-value manipulation that I co-founded in 2009, it's that we postmodern types are highly susceptible to the glamour of objects we recognize as totems, talismans, and idols. Also, the last time I saw a despot's statue toppled — I was working at The Boston Globe, in April 2003, when a colleague turned on the wall-mounted TV so that we could watch Saddam Hussein's statue in Baghdad get yanked from its pedestal — the message beamed into my archicortex was Meet the new boss, same as the old boss rather than Sic semper tyrannis. Perhaps it was because the Marines whose armored vehicle had done the toppling first draped the statue's head with an American flag, then quickly removed it — i.e., so the toppling would look like a local crowdsourced action as opposed to a foreign military one. Did Saddam's statue command the Marines to screw up an otherwise terrific piece of propaganda? At any rate, the statue seemed "almost to will its own collapse," as one scholar of iconicity put it. Now that Iraq has turned into a Vietnam-like quagmire, and now that the excitement of Barack Obama's election has curdled somewhat, Americans aren't easily impressed by the toppling of despots' statues. The visionary creator of Fable III, Peter Molyneux, has anticipated this sociopolitical moment. He tells us that, in conceiving of the sequel to the more straightforward Fable II (2008), he decided that "the most interesting thing is what happens after the battle…. what it's like to be king." Only the first half of Fable III is devoted to overthrowing King Logan. In order to do so, Hero must gain the people of Albion's support, and then, during the game's second half, the player must choose whether or not to follow up on those promises. At the risk of losing Albion's approval. Hero must make decisions about crime, poverty, taxation, the death penalty… not to mention the threat of war with a Middle Eastern-style neighbor country. It's all too easy, in other words, for Hero himself to become a despot. At which point, one assumes, laboring under an obscure but powerful compulsion, he'll erect a giant statue of himself. 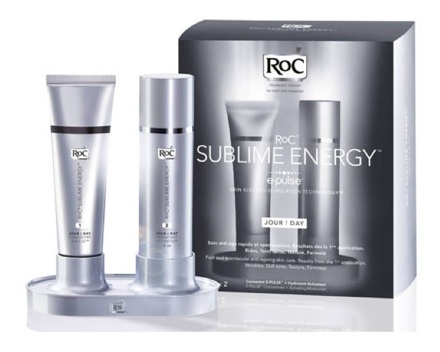 RoC’s new ‘Sublime Energy’ face cream introduces an electrical current into the skin, heightening inter-cellular communication, which is said to have a rejuvenating effect. 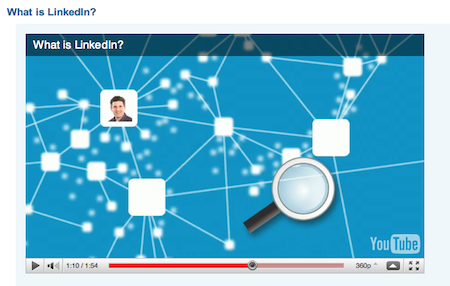 With ‘communication’ the core symbolic value here, the line clearly draws juice from social networking codes. It makes communication a value in and of itself, with what’s being communicated (the message), secondary to the fact that communication is happening at all. In its pack design, Sublime Energy represents itself as a communications ‘device’: like the devices that enable social networking, its creams sit on a base that looks very much like a charger. And its language constantly draws on social networking themes. For instance, the product is said to harness the power of the cellular ‘network’, enabling cells to ‘signal’ to each other. In a sense, this is a new take on an already-powerful symbolic code: skin as a medium of communication. Whether through blushing, paling, breaking out in spots, or wrinkling, skin is a ‘text’ that can be read by any dermatologically-inclined semiotician. ‘Pro-age’ discourse, for instance, often talks about how wrinkles ‘tell stories’ and how you can ‘read’ someone’s life experience in their face. But the book of skin is, strictly speaking, about expression rather than communication. In other words, it expresses what’s inside the person: emotions, thoughts, experiences and so on. For Sublime Energy, there’s no ‘inside’ or ‘content’ — just a single plane of communicational flow. In this post-humanist model of skin as communication, Sublime Energy also moves beyond the previous difficulties and disjunctions involved in the idea of ‘skin as sign’. Along with gesture, skin is the prime example of a hysterical mechanism: displacing and betraying what can’t be said in language. Blushing and paling are perhaps the best-known examples — but skin break-outs of all kinds can be seen as hysterical forms of expression. As one of the body’s most treacherous and hysterical mediators, skin’s relationship with the communication has previously been about the broken links in the chain, the unsaid, the blocks and repressions — rather than the seamless flow promised by Sublime Energy. It’s arguable that the more repressive a cultural system, the more it values the seeping out of the unsayable, as in the subtle eroticising of female blushing in 19th-century England. Sublime Energy promises to lift skin out of its hysterical history, freeing up its channels of communication so that there are no more repressions, blockages and ‘unsaids’. In this post-human, post-hysterical manifestation, skin becomes a clear and purified channel of free-flowing communication, valued for its operational perfection rather than for its ability to act as one of the body’s more unpredictable and uncontrollable forms of language. American lifestyle magazines and reality shows are relentlessly on-message, at the moment, when it comes to clutter. Forget any romantic notions about the artist/genius whose studio/office looks like a disaster zone, or the un-uptight family (e.g., the Sycamores in Frank Capra's 1938 comedy You Can't Take it With You, or George Bailey's happy family in It's A Wonderful Life) that collectively refuses to stress out about domestic disorder. The media's message today is 100% modern, all business: Clutter is never OK.
From the dominant cultural perspective, clutter is a symptom and sign of an out-of-control, excessive lifestyle. There's also a social class angle: yards littered with rusty vehicles, sprung couches, and lawn ornaments are the first thing to disappear when a working-class or poor neighborhood is gentrified. However, in recent years, the moral discourse around clutter — it dates back to the Puritans — has been medicalized, lent a scientific aura. 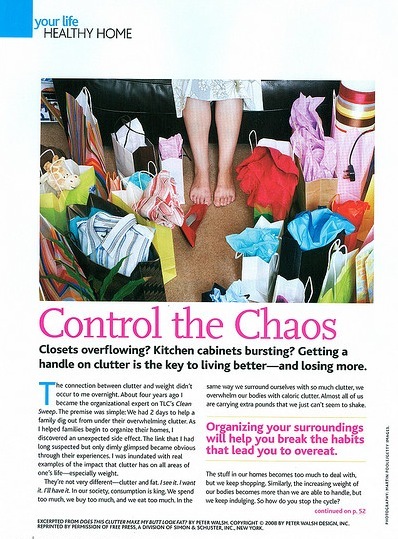 The title page of a feature article (shown above) found in an issue of the magazine Weight Watchers speaks volumes about the mainstream anti-clutter position. "Getting a handle on clutter is the key to living better — and losing more [weight]." As the author of the feature shown above puts it, "in the same way we surround ourselves with so much clutter, we overwhelm our bodies with caloric clutter." I'm pretty sure that this statement is what Aristotle would call an example of ignoratio elenchi, i.e., an argument characterized by a conclusion that does not logically follow from the stated premises… but let it pass. The dominant cultural theme is apparent: Men and women whose homes or workplaces aren't spartan and tidy are fatally, suicidally self-indulgent. In an economy that encourages workers to be rolling stones, it's forbidden to gather moss. Many other magazine features, particularly in women's magazines, link clutter to psychological stress. In the same way we surround ourselves with clutter, one pseudo-expert after another warns, we overwhelm our fragile sense of wellbeing with mental clutter. Reality TV shows like TLC's Clean Sweep and A&E's Hoarders take this meme to its logical extreme: they visit the homes of obsessive-compulsive clutterers and, in doing so, encourage the viewer to ask him- or herself, "How close am I to being one of them?" Despite my snarky tone, I'm not opposed to keeping one's household or workspace neat and tidy. Nor do I disagree that Americans consume too much, goods- and food-wise. However, marketers and others looking for an emergent way to signify psychological wellbeing or balanced lifestyle should think carefully before adopting the usual modernist aesthetic. A romantic, cluttered "brown" aesthetic is due for a comeback any time now. * See Gareth Lewis's recent Semionaut post suggesting that in the UK it's not necessary to choose sides in the clutter vs. order culture-wars. Sometimes, two wholly oppositional codes appear on the end of a semiotician’s fork at the same time, leaving the practice of coding culture neither figuratively nor literally straightforward. Indeed, one of the challenges facing commercial semiotics in a post-structuralist cultural landscape is to account for memetic intermingling, unholy copulations. I want to look at one such instance here. 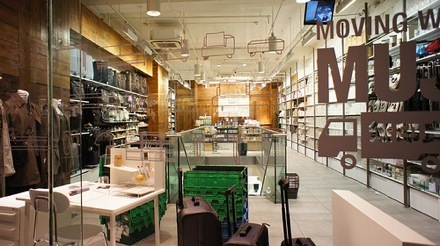 The clothing, furniture and stationary shop MUJI is a fine exponent (though hardly an original architect) of a coding species that has become an alpha staple of the UK retail market over the past three years or so. Specialising in the streamlined production of minimally packaged, logoless consumer goods, the MUJI shop floor is a place of almost yogic quietude. Admittedly, there’s usually someone going berserk at the doodle-pad, but overall the place is calm and curative. Its unforced tidiness appeals to the Obsessive Compulsive in us all. I’ll paint you a picture. In the MUJI Universe, nobody has a name exceeding one syllable in length. In fact, people answer to a single, lower case letter. Discussion is kept to an absolute minimum (banter is baggage, after all). It’s a place of flawless complexions and soothing smiles. Everybody’s outfit looks like it began life as an envelope, and will one day return to that blissful, postal state. There isn’t an Apple laptop in sight (No Logo's Allowed), but the whole experience is a bit like being sucked into an iPad down a black hole app. In the store itself, ask for help and it arrives in three neat steps: the employee calmly acknowledges the customer’s predicament, gently whispers the word “follow," then glides across the shop floor to The Point Of Desired Object. I exaggerate. But only a little. Now, contrast this with the ramshackle appeal of a hipster café. Combination, miscellany and baroque-mockery is the order of the day. No room for a right angle. In my own local, every surface has an object nailed to it (many are oil paintings — think Robert Duncanson with a Dalek twist). There’s a wall-mounted ginger cat, a manikin sans abdomen that props up the bar, and a garrulous clientele with haircuts that would give M.C. Escher a migraine. (Incidentally, you can detect palpable and quite toxic opposition to this kind of lifestyle coding emerging in the UK. There’s nothing particularly idiosyncratic about wearing lime green Wayfarers — so the thinking goes — and nothing clever about orthodontic neglect). The point here, though, is that these two codes emerged in unison. Traditionally, commercial semiotics has tended to order and portion. It likes to sit on the stationer’s side of the divide. Do we need to adapt our methodologies to map an evolving cultural cloth? The binary detailed here feels particularly extreme. In fact, it seems more than ever to support the argument for a neat and tidy breakdown. But then there’s always that guy at the doodle pad, losing his head while all about him are keeping theirs. And the girl in the hipster café draws Lego antlers in a plain rectangular notebook that looks awfully familiar. Semiotic analysts need to remain open to the possibility of cultural cross-pollination, even in instances where it seems least likely. "I feel great… body and soul!" 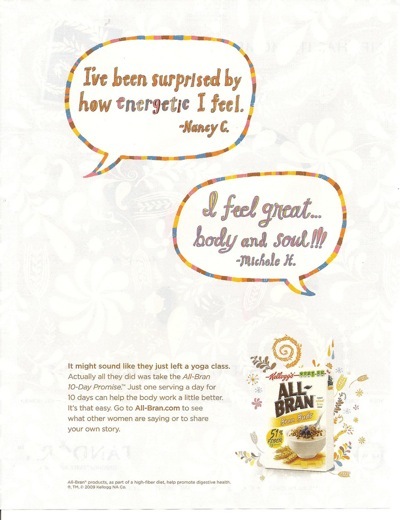 testifies Kellogg's All-Bran eater and correspondent Michele H, in the advertisement below, found in the US magazine Real Simple. "I've been surprised by how energetic I feel," another All-Bran fan comments. The latter review won't surprise anyone. In the US, as everyone already knows, breakfast is fuel for hard-working cyborgs. However, Michele H.'s review might strike non-Americans as bizarre. How did breakfast cereal become soul food, in the United States? For the solution to this riddle, we take you back to the late nineteenth century, when John Harvey Kellogg ran the Battle Creek Sanitarium, which was owned and operated by the Seventh-day Adventist Church. Dr. Kellogg was concerned above all with reducing sexual stimulation — which is why, at a time when his wealthy patients were accustomed to eating eggs and meat for breakfast, he fed them instead a form of dry cereal that he'd invented: corn flakes. Do corn flakes lower libido? It's doubtful: Kellogg also performed circumcisions on adult male patients, because he believed that this would help prevent masturbation. In 1895, one of Kellogg's former patients, C.W. Post, founded a cereal company selling Post's invention, Grape Nuts. In 1908, Post started selling a rival brand of corn flakes which he named Elijah's Manna. Post was not nearly as devout a Christian as Kellogg, as far as I know, but of course manna is the food that God provides for the Israelites in the Book of Exodus. (When raw, it tasted like wafers made with honey. Some scholars suggest that manna might have been the crystallized honeydew of certain scale insects, still considered a delicacy.) Elijah's Manna was later renamed Post Toasties. Takeaway: In America's collective unconscious, breakfast cereal connotes religiously inspired self-mortification. Unlike bacon and eggs, dry cereal is go(o)d for you. 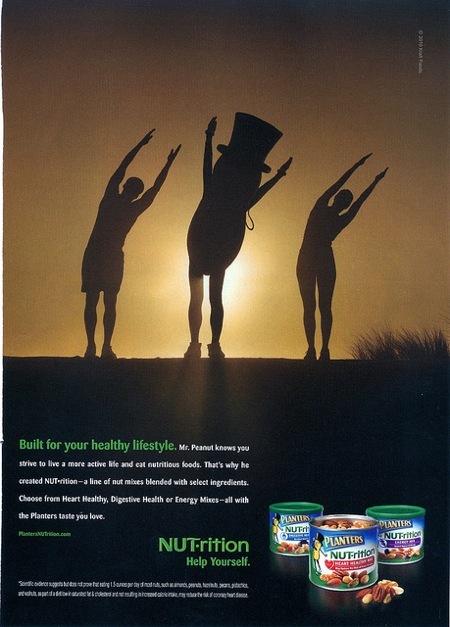 For more examples of spiritualized breakfast cereal advertising, see a longer version of this post at HiLobrow.com. As luxury scrambles to give itself an alibi, either through 'graceful deprivation’ codes, or through patronizing art foundations, the cognac category is fighting a rearguard action. The implacable stoutness of the cognac bottle's base and the haughty imperiousness of its stem seem somewhat anachronistic. Yet whilst malt whiskey in the past few years in the UK has sedulously communicated on connoisseurship and cogitation, cognac has clung stubbornly to the notion of opulence. Marketing to peacock-like young men eager to advertise their successfulness, it has also produced some of the most cringeful advertising of the last few years, including a turkey (below) from brand leader Courvoisier. A tag line reads “Look but don't touch. Actually don’t even look” which has to be one of the most obnoxious lines in the history of advertising. They use a peacock feather in the background but suffice it to say that the effusive bottle design does not require embellishment. Do not let Judith Williamson loose on this one. 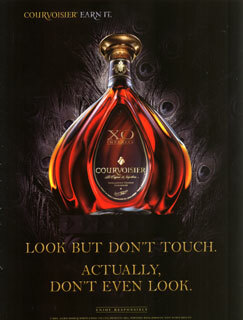 What version of male prowess can we read into cognac bottles? Like the heavy doors or the muscular ripples on the fuselage of a Bentley or Maybach, this sculptural display signifies imperiousness and a prowess that sweeps all before it. More ruggedness in design is everywhere (baby buggies etc), but arguably, cognac bottles are better characterized as corpulent – they splurge distended bellies. The mythology of each brand is inscribed into the bottle shape. This is a case of mythology through glass sculpture. Remy Martin favour the notion of drapery and folds to signify opulence, Courvoisier the splayed fluting of the neo-classical architectural structure that was the style favoured by Napoleon, a most infamous patron. Hennessy prefer to plump for the jowled heaviness of the absolute monarchy. (There was something very apt about Kanye West wearing black, decked out in sun shades and swigging from a bottle of Hennessy in the wings before storming on stage to tell Taylor Swift that he was about “to let her finish” at the MTV music awards last year.) Martell use the triumphal arch as the signifier of glorious wealth. It can be said that there is an edifice complex in miniature at work. But this seems to change as you go up beyond the XO tier into the super premium category where decanters become delicate artefacts the price tags reach £2,000 and brands segue into the winsomeness of perfume codes. Remy Martin Louis XIII looks to belong in Marie Antoinette’s boudoir not in a man’s drinks cabinet. What’s going on? There is something incongruous in the slightly effete intricacy in these bottles. On the one hand it is hard to see them working in the context of a mahogany walled room amidst macho cigar smoke. On the other hand, luxury is increasingly hybridizing with art and many of the expensive bottles look more like ice sculptures than glass. Certainly brands that seems to celebrate gout ridden sovereigns do appear incongruous in the context of luxury which is becoming less cloying, self satisfied ad given to facilitating experiences (Hermés). The pudgy, soft profile conveyed in these bottles is certainly out of step with the austere times. Marc Jacobs’ designers favoured a flat stomach with rippling abdominals. His new perfume bottle for Bang is the antithesis of the cognac paunch. Does this signify the need for men to be lean mean and roll with recession packed punches? What does it say about the ferment of cultural codes when perfume packaging is getting a six pack and out muscling heavy liquor? I’d say it is time to uncork your best cognac and toast the semiotician. What does the Speaking Tree tell us? 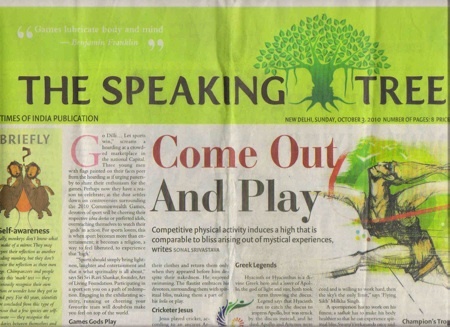 The Speaking Tree is an eight-page weekly supplement on matters spiritual, attached to India’s largest circulated English language newspaper, the Times of India. It's a medley of material, written for easy weekend reading, spirituality ‘lite’ for the time-starved, go-getting wage slave seeking to live a materialistic and successful life, yet uplift his soul. Also, India’s young and ambitious who are already beginning to get burned out by the race to the top are seeking to re-connect with their spiritual roots; they seek answers to the puzzles and conundrums of their lives. Drawing from the concerns and preferences of contemporary living, the paper urges its readers to energize themselves, to celebrate their life, to create, to discuss, to contemplate, to explore and to practise. In keeping with the modern achiever’s spirit of action and dynamism, even reflection and contemplation are presented as active verbs, born of intent to engage with the world rather than retreat from it into the monastery or the wilderness. Wellness as inner peace is presented by Deepak Chopra, the trendy guru who combines American concepts of positive thinking for success with ideas of consciousness and meditation drawn from Hindu and Buddhist philosophy and metaphysics. Good health as balance and undiagnosed illness as body-mind imbalance are also explored. The reader is nudged to re-examine his or her state of health through the body-mind prism. Ideas from Tantric meditation and Vipaasana Buddhist meditation are presented along with descriptions of pilgrimage sites and explanations of the cultural and religious significance of Hindu festivals, with all of their associated mythology. The writings of saints and mystics from around the world are liberally quoted — be they Christian, Buddhist or Sufi, Greek, Chinese or Persian. In all of this, the paper follows the hidden codes of the Hindu ethos – an eclectic view of faith. Each believer has his own path, according to this view, and there is no one right path. Here is an example of a religious ethos demonstrating an ability to refresh its ideas and presentation with the changing times — and to permit the peaceful co-existence of contradictory, even opposing ideas under the big banyan tree. Empowerment is an essential sign of women’s emotional well-being in British culture today. TV makeover shows regularly portray women transforming their wardrobes, and themselves, from dowdy and self-doubting (invisible) to confident and empowered (bright and visible). Red shoes occupy a special place at the intersection of empowerment and visibility. Not only are they a bold and daring fashion statement — they take us into the symbolic domain of the fairy tale, a genre steeped in the empowerment theme. In Clairol’s ‘Red Shoes’ ad, a timid heroine dreams of empowerment — or in fairy-tale language, becoming the princess that she truly is. 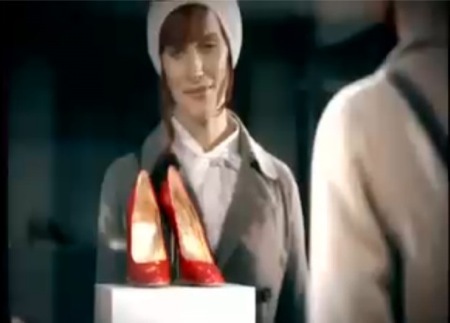 Thanks to her magical helper, the brand itself, she becomes brave enough to ‘steal’ her new power (symbolised by the red shoes) from under the nose of the wicked witch (the snooty sales attendant). 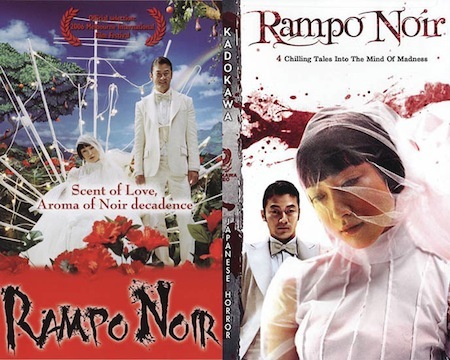 Bravery, disguise, theft and flight, all the fairy-tale themes are there. So is the most important fairy-tale motif of all: the triumph of mobility and daring over determinism and fate (the cruel gaze of the sales attendant), the powerless outwitting and outpacing the powerful. But going back to one of the milestones in the development of the red shoes symbol, we find a different story. Hans Christian Andersen’s tale ‘The Red Shoes’ uses the symbol not to empower the heroine Karen, but to push her back into the fate she’s desperate to escape (that of the poor, invisible village girl). Karen’s red shoes end up grafting themselves on to her feet and carrying her away in a dance she can’t stop or control. It’s her own desire that turns around on her, overwhelming her will and forcing her into a parody of the mobility she wants so much. The red shoes here go into symbolic reverse: from a source of power, they become an instrument of alienation and compulsion. Magical bringers of empowerment, wilful destroyers of autonomy — red shoes fulfil both these roles in Andersen’s story. Returning to the symbolism of shoes today, we see the same undecidability at work. Shoes in general are described both in the language of empowerment and aspiration, and in that of alienation, fetishism and pathology. Women are often seen as being ‘out of control’ when it comes to shoes: prey to addiction, compulsion and obsession. But at the same time, their shoes seem to offer magical lines of flight out of all kinds of traps and dead ends. And because they come with an extra symbolic helping of magic both helpful and dangerous, red shoes in particular walk the line between aspiration and alienation, mobility and repetition, liberation and compulsion. Click here for a PDF essay in which Kate Bush tries and fails to expel the alienation from her red shoes. You are currently browsing the Semionaut blog archives for October, 2010.